Tonight at 7:00 PM, the Shanghai Dragons will play the Dallas Fuel for the first game of Stage 3 in the Inaugural Season of the Overwatch League. This game is important for one crucial reason: The first female player, Se-hyeon “Geguri” Kim, will most likely make her debut for the Dragons. Geguri is a famous streamer on Twitch who is known for her great D. Va and outstanding Zarya play. In fact, it was later revealed that her play inspired Joon Hyuk “ZUNBA” Kim to play Zarya. ZUNBA is now a player on the Seoul Dynasty and is widely considered to be the best Zarya in the world. Unfortunately, the road to pro is not easy for aspiring eSports players, and for Geguri, one of the first well-known female players, chasing her dream of playing professionally was even harder. Geguri was known for a famous case back in 2016 when, after her team, UW Artisan, won a match, players from the opposing team, Dizziness, accused her of hacking due to her godlike aim on Zarya. Two players on the team started to give her death threats, while some players said that they would quit Overwatch if she wasn’t hacking. Curiously, one of those players who said he would quit was Jaemo “Friez3” Koo, a sub-tank who now plays under the handle XepheR for the Seoul Dynasty. However, another Dizziness player, Jun Hwa “janus” Song stayed out of the whole situation, while the one other Dizziness player, Yeon Oh “Nanohana” Hwang, took Geguri’s side in the argument. Nanohana (who later changed his name and became the famous player fl0w3r) and janus were later signed by the LuxuryWatch organization, and later went on to be signed by the current best team in Overwatch, the NYXL (fl0w3r is still underage and will not be able to play until Season 2.) The other players all quit when it was revealed that Geguri was in fact not hacking, save Friez3, who moved to the NA region and signed under his new handle to Cloud9. Fast-forward to mid-2017, when the rookie team ROX Orcas announced Geguri’s signing to play for them at OGN APEX Season 4. This would put Geguri as the first female player in APEX, the premier league prior the OWL. ROX Orcas, a sister team to the famous League of Legends team ROX Tigers, did not have many other strong players, and when put in a group with eventual “royal roaders” GC Busan, the strongest rookie team LW Red, and previous bronze finalist Afreeca Freecs, the Orcas had a disappointing 0-3 performance. However, their strong play was recognized, and Geguri’s teammate, Nam-ju “STRIKER” Kwon, was later drafted to the Boston Uprising. When the final OWL rosters for Stage 1 were eventually shown, fans were saddened by the fact that Geguri apparently missed the cut, but not surprised. Throughout Stages 1 and 2, the Shanghai Dragons were unanimously thought of as the worst team in the league. From a nation that had promising teams such as Miraculous Youngster and 1246, the Dragons mostly signed players from LGD, a team that showed promise in early 2017 but started to fall apart when faced with corruption from both the players and coaches. The lone bright spot on the team, Weida “Diya” Lu, was overwhelmed by the pressure and temporarily moved back to China, and the second best player, Chao “Undead” Feng was in a bad situation after he was revealed to be cheating on multiple girlfriends- apparently one had to have multiple abortions. Undead was later released. Currently without a single victory, the Dragons had their backs against the wall. But luckily, the signing window opened up, and the Dragons made four key moves. First, they signed Junjian “Sky” He, a player that used to play under the name “zhufanjun” for Miraculous Youngster, widely thought as the best Chinese Zenyatta player. Next was Eui-seok “Fearless” Lee, a main tank from the most promising Korean rookie team, Element Mystic. Fearless is known for his Winston and Roadhog. Gi-hyeon “Ado” Chon is a popular DPS from MVP Space, mostly known for playing Genji. Finally, the Dragons announced that they would be signing Geguri, making her the first official female player in the league. Geguri’s impact has been huge worldwide. She inspired the organization For D. Va, a Korean group supporting female gamers. 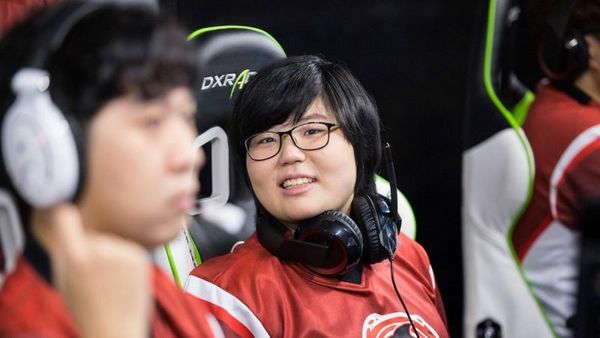 She also inspired many female players to play Overwatch both casually and competitively, as many female users on the r/CompetitiveOverwatch subreddit say that Geguri was their inspiration. Multiple female players are starting to appear in Tier 2 leagues, such as Lucky Future’s 177 and the entirety of Team Venus. The Overwatch League is already a diverse league- Austin “Muma” Wilmot of the Houston Outlaws is already the first openly LGBT player, and with the addition of Geguri, the league is becoming very diverse. With Outlaws Jake “JAKE” Lyon and Shane “Rawkus” Flaherty appearing on the Today show with Megyn Kelly, as well as NYXL player Jong Ryeol “Saebyeolbe” Park scheduled to throw the first pitch at a Mets game, the OWL is only growing in popularity. Geguri will most likely make her debut against the Dallas Fuel tonight. Made from the core of Team EnVyUs, the Fuel had high expectations, but they struggled to stick to the meta, and are now only one spot above Shanghai on the standings. If the old Dragons roster were ever going to win a game, it would be against Dallas. With Ado, Fearless, and Sky, the Dragons have more hope than ever, but the question still remains: Can Geguri save the Shanghai Dragons? If you want to find out, tune into Overwatch League Twitch at 7:00 tonight, or access the MLG Stream from the Overwatch League website. Dragons Fighting!